I bought this after buying a crafty fake copy of a Samsung microSDHC from Ebay. This chip works great, no more corruptions, lost data etc., works perfectly...the exact opposite of my experience with the Samsung chip, which looked exactly like the real one and worked...for a little while...then continually corrupted because of course it was a bogus Chinese knockoff, right down to the trademark on the chip. The card is ultra fast and works in my Win 7 PC, Galaxy S3 and my new Note 10.1 2014 Edition (what I bought it for). I had no issue plugging it in and all my devices recognized it and worked with no issue off a SD card adapter (one I already had). I did the SanDisk speed test on this card compared to my Class 6 and there is now comparison, this card is just 10 folds faster. I tried to use the USB adapter that came with this card, however I could only copy stuff to it for about 3 mins then it would just stop working in my PC. I used the SD Card adapter that came with the Micro card and it was fine. I used another adapter i already had and it was fine. The card itself seems fine but the micro to full-size SD adapter that came with it doesn't work-the disk just never mounts. I've had to use a USB adapter for the card to read/write to it from my computer. Contacted the company through Amazon requesting the adapter be replaced but have not received a response. We'll see if a crappy review gets their attention. Update: the card has since completely stopped working. Going to their web site was very frustrating to find how to get warranty service. Have not received a replacement. I was in need of TWO 64GB memory cards. After seeing the 4.7 stars out of 1,133 reviews and the product description of "70MB/s", I decided to purchase both, this Komputerbay 64GB Class 10 UHS-1 and SanDisk Ultra 64GB microSDXC Class 10 UHS-1. Both, SanDisk and Komputerbay's items arrived together. Komputerbay: Item was a clear plastic case,a "SAMSUNG" microSD adapter, and did not include the 64GB memory card. - Item was loose, not sealed, taped or protected in anyway. SanDisk: Item was protected in a sealed rigid cardboard mailer. Inside was the clear plastic case containing correct contents, warranty literature, and product information. - Item was what was advertised. Within minutes said I'd be refunded and to return what ever contents I did receive. They also stated a replacement isn't available from this seller. Re-order if same product is needed. Nice Review by R. Lorenzana "fotoman"
Great product! Review by John Ubana "John Victor Ubana"
This thing has given me so much trouble months after I bought it. The price is great, but the quality is lacking. It constantly gets corrupted and won't allow my GS4 to read it. I have had to reformat countless times and now it wont even let me do that. It also won't allow me to copy files to it. Good value Review by Gerald Pruden "Jack of All Trades"
1. Moved Apps from my device to the microSD card, very quick. 2. Played and used apps running from the microSD card: slight lag according to my friend (who is an art minor), but none that I noticed. 4. Transfered pictures from my phone to the microSD card. A Great Deal! Review by D. Laufer "rockhound"
I had purchased a 64GB SD prior to this one that would not format and work in the Lenovo tablet I have. So when I came across this one, I decided to give it a try, as I have had good luck with SanDisk products. I am happy to say that it worked great. It is fast to download to/from and graphic are sharp. Great Product!! Review by Amazon Customer "Red Sox fan"
Was told that it Worked Great!! No Problems with it at all. Works fine! Review by Fogymtn "Smart Man"
Great price, great USB adapter Review by Debra C. Covey "Guitar Wife"
I purchased this recently to go along with my new Samsung Galaxy Note 10.1 2014 edition tablet. While it is definitely a 64 gig class 10 SD card it doesn't function anywhere near 70 MB per second. I have computer software that does simple read/write tests of files of varying sizes to test the speed of these cards. It's been accurate with every other SD card (including the high-speed ones like this is supposed to be) and the speed number has always been what the testing cards claim. Except for this one. As I said it is a 64 gig card. However, the top speed of this card (regardless of the file size) tops out at 30 Mb per second. Less than half the speed it claims. Was not a Samsung card, got refund. Review by David R. "m14e2"
i didnt work Review by Theodore F.
I didn't run any speed tests on this, but my uses cases for it worked flawlessly. I used this as an expansion to the storage on my Dell Venue Pro 8 to store movies, primarily HD in format, and have had 0 issues. Was looking for a large sized memory card for my DSLR camera and decided to try the SanDisk after doing a lot of research online. Bought it in December 2013 and waited until I had used it a while before writing a review. Since I got it, it's been working fantastic and I have no complaints ... still going good and still haven't been able to fill it! 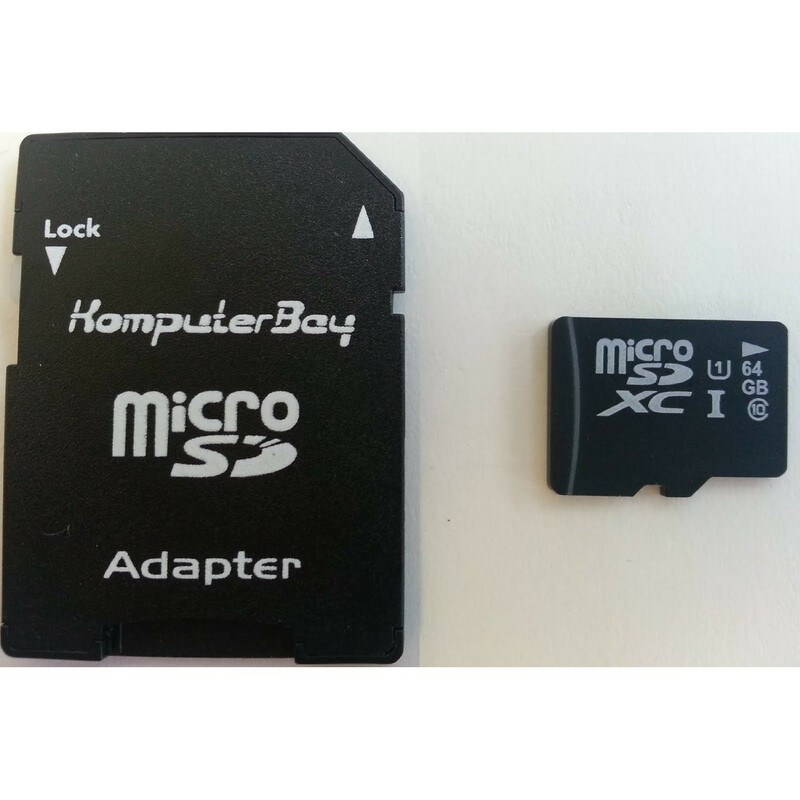 Great price and device Review by Rhonda "Rhonda"
I'm using this Komputerbay 64GB microSD for my windows 8 tablet. I needed the extra space but didn't want to spend loads of extra cash. 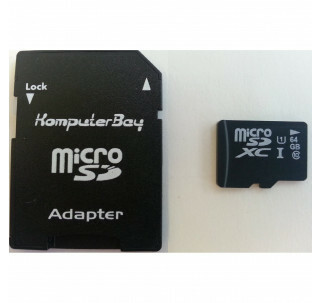 Compared to other 64GB microSD's this is competitively priced and undercuts many other brands. This is basically an unbranded Samsung MicroSD. You are getting the 64GB storage that many other cards offer however at much faster transfer speeds (70mbs vs 40-50). I've been using this for a little over two months and have had 0 hiccups. You just plug this in and transfer things as you wish. -Can be submerged for up to 24hours - Not that you'd want to do this, but I can't tell you how many times I've forgot memory cards in my pocket and then washed them. Yikes! -Price - Yet again, I can't stress how good of a deal this is. I searched quite a bit looking for a good card at a great price. This is certainly the card. For its storage capacity and transfer speeds, this is the best deal out there.